Everyone has a label they use to explain our dear leader. We were using "Communist" long before it was cool. Whatever label you use - defend it. The fact that for the first time in my life a major portion of the population is clammering with labels to explain the odd, anti-American behavior of this guy carries more weight that any consensus on a specific label. As for "Communist", we know there is some flaw there. Lenin, Stalin or Mao wouldn't be seen in public with this guy. Obama is a piker compared to them. He fails at Liberty and Capitalism, and he fails at Total Nationalization and Redistribution. 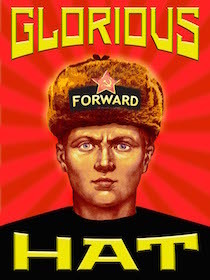 We'll bet a cold glass of Leninade 100% of the country will be glad he's gone in 2013. Top image from FB Friend, and bottom image is the design of one of our hat's side panels.